Project updates - Neutrinos and nucleosynthesis in hot and dense matter. Alford, Han, and Reddy propose a new family of astrophysical objects, which can theoretically exist if quark matter is stable ("the strange matter hypothesis") and the surface tension of quark matter is low enough. In this case, quark matter is not self bound. At sufficiently low pressure and temperature, it will take the form of a crystal of positively charged strangelets in a neutralizing background of electrons. In this case there will exist, in addition to the usual family of strange stars, a family of low-mass large-radius objects analogous to white dwarfs, "strangelet dwarfs". Using a generic parametrization of the equation of state of quark matter, the authors have calculated the mass-radius relationship of these objects. have unexpectedly large effects in a superfluid. discuss different superfluid and superconducting pairing patterns. This paper has been accepted for publication in Physical Review Letters. The preprint can be viewed online. The research was supported by this Topical Collaboration, and also by the Nuclear Physics office of the U.S. department of Energy. In an article titled "Proto-Neutron Star Cooling with Convection: The Effect of the Symmetry Energy", L.F. Roberts, G. Shen, V. Cirigliano, J.A. Pons, S. Reddy, and S.E. Woosley, study protoneutron star (PNS) evolution. We find that PNS convection is largely driven by compositional (lepton number) instabilities. The extent and duration over which convection operates in the PNS directly impacts the early deleptonization and cooling timescales. In this work we identify that the buoyancy of dense matter varies greatly with the density dependence of the nuclear symmetry energy. We then performed PNS simulations using equations of state with different density depend symmetry energies to show that they result in discernible differences in the neutrino signal. The article has been accepted for publication in Phys. Rev. Letts. and can be accessed online. For many years, it was believed that flavor oscillations of supernova neutrinos are described by the MSW effect, just like in the Sun. In recent years, however, it has been realized that in a supernova a novel collective mechanism is also in play. The resulting collective oscillations occur much closer to the PNS than the MSW resonances. In fact, it is valid to ask whether the oscillations exist close to, or even inside, the neutrinosphere. The latter possibility would require a significant revision of the basic neutrino transport paradigm. Duan & Friedland have recently investigated collective oscillations during the late (cooling) stage of the explosion. They have shown that the frequently used "single-angle" treatment of the flavor evolution indeed predicts that oscillations start right at the neutrinosphere in this regime. Thus, the standard lore of the field would suggest that the basic picture of neutrino transport is in jeopardy. Upon further investigation, however, the authors uncovered a novel effect that suppresses oscillations close to the neutrinosphere. In the full "multiangle" calculation, the supernova transport framework is saved. The paper has recently been accepted to Phys. Rev. Letters. In addition to the numerical results from the supercomputer simulations, the paper also explains the physics of the "multiangle" suppression. The attached figures from the papers show the onset of the oscillations in single-angle and multi-angle calculations, as well as the highly nontrivial pattern of oscillations as a function of the neutrino energy and angle of emission. The low energy dynamics of the neutron star crust is relevant to understanding diverse neutron star phenomena such as superbursts, giant flares, thermal relaxation and pulsar glitches. In the crust a lattice of ions coexists with a superfluid and the coupling between these systems is strong. This coupling has been ignored in all previous studies of the neutron star crust. Vincenzo, Sanjay, and Rishi have formulated an effective field theory to describe this coupling and its implications for oscillations and entrainment in the neutron star crust. The manuscript is available for comment. The figure shows how neutron-proton interactions induce a mixing between two longitudinal modes of the lattice and the superfluid in the crust. 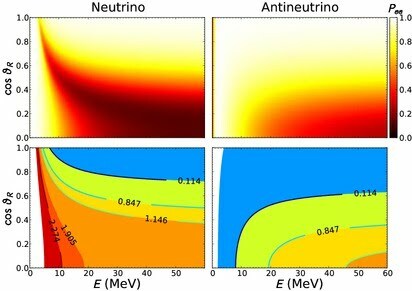 Gandolfi, Carlson and Reddy have computed the energy per neutron in dense neutron matter using the Argonne model for the 2 nucleon potential interaction and Argonne/Illinois model for 3 nucleon interactions. Calculations indicate that the short-distance, spin and angular momentum independent 3 neutron force makes the dominant contribution at supra nuclear density. At nuclear density this manifests in a very strong (linear) correlation between the nuclear asymmetry energy and its derivative with respect to density. While the nuclear asymmetry energy is expected to be 32 +/- 2 MeV its derivative, related to the parameter called L, is poorly known. A precise experimental determination of the L would provide a stringent test of our model for 2 and 3 neutron interactions.